There are few things in life as satisfying as that first bite of a perfectly cooked, warm chocolate chip cookie, dipped in milk. I don’t what it is about that combo, but just thinking about it makes my taste buds salivate. I’ve made a lot of cookies on my smoker, but these smoked chocolate chip cookies are the best ones I’ve made by far. Looking for other smoked dessert ideas? 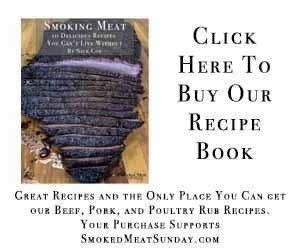 Be sure to check out all of my favorite smoked desserts here. How do you decide what makes a cookie good? For me, I look at three things. The taste has to be just right. The cookie should almost melt in your mouth when you bite into it, and then that buttery flavor should get chased by the chocolate chips. While the inside is moist, the outside should be just a little bit crispy. I think these smoked chocolate chip cookies passed all three tests. 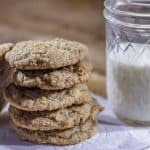 While the general concept of making chocolate chip cookies is simple – it’s easy to just throw all the ingredients together in a bowl, mix them together, and then bake the cookies – but there’s more to it than that. Once the butter is creamed (usually about 4-5 minutes on medium speed), add two eggs and a teaspoon of vanilla. Continue mixing for an additional minute. Put two and a half cups of flour, a half teaspoon of salt, and a teaspoon of baking soda in a sifter. Sift it into your creamed butter mixture. Sifting adds a little bit of air to the flour that will benefit the structure of the cookie. Scrape the sides of your mixing bowl with a rubber spatula, and then turn your mixer on to low. Let it mix a little, and then scrape the sides again. STOP mixing when there are one or two streaks of flour left in the cookie dough. If you mix more than this, your cookies could get gummy in texture. Scrape the sides of your bowl and pour in a cup of chocolate chips – I used Hershey’s Chocolate and Toffee bits – and turn the mixer to low again. It should take just a few turns for the chocolate pieces to be well incorporated. Now that the hard parts done, it’s time to cook the cookies. Line a large baking sheet with parchment paper. Using a medium cookie scoop (about 1.5 tbsp) drop evenly spaced dollops of cookie dough onto the cookie sheet. 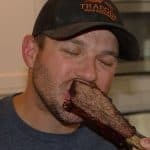 Preheat your smoker to 350 degrees. Place the cookie sheet in your smoker, and let them cook for about 12 minutes. 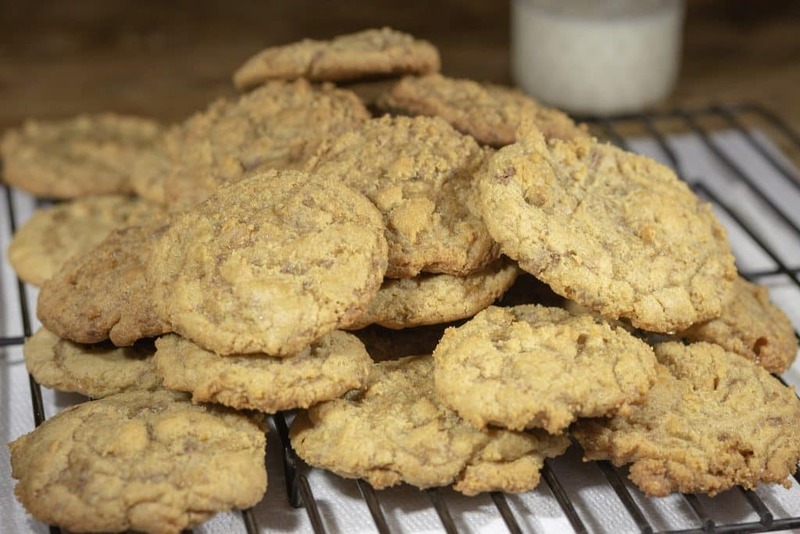 Remove the cookies from your smoker, and let them sit on a cooling rack while you continue to cook the additional cookies… This recipe makes about four dozen cookies. I really can’t say enough great things about these cookies. I’m blown away by how great they taste, and how easy they were to make. I’m definitely going to be making these again soon, and I am so glad I’m able to share this simple recipe with you. Once the butter is creamed (usually about 4-5 minutes on medium speed), add the eggs and vanilla. Continue mixing for an additional minute. Let it mix a little, and then scrape the sides again. STOP mixing when there are one or two streaks of flour left in the cookie dough. Line a large baking sheet with parchment paper. Using a medium cookie scoop (about 1.5 tbsp) drop evenly spaced dollops of cookie dough onto the cookie sheet. Let them sit on a cooling rack while you continue to cook the additional cookies. Makes 4 dozen cookies. Based off of the recipe by Hershey’s. Modified to use less chocolate, added more time, and cooked in a smoker.